The herbs are growing more and more each day as the weather warms up. I’ve growing my herbs for a few years now, and rosemary is one of the easiest herbs to grow. Rosemary is usually thought of being used in savoury applications since for its nice earthy flavour in stews and meat dishes. It is actually a great addition to desserts or sweets if not used excessively since it might give off a medicinal flavour. I adapted this recipe from the Mini Gâteaux Breton recipe I found in the book The Baking Bible by Rose Levy Beranbaum. Gâteaux Breton is a type of butter cake originated in the Brittany region of France. It has a dense crumb, and the texture is between a pound cake and shortbread, very similar to a Sablé Breton. It is traditionally baked in a bigger round pan, I find the mini ones easier to eat and are perfect a tea time treat. The original recipe makes smaller ones but I baked mine in bigger brioche pans and it worked out nicely. Since they are not too sweet, I can easily finish one with a cup of coffee in one sitting. Yield: 10 brioche pans size of 3 inches / 7.5 cm in diameter and 1 inch / 2.5 cm high. Preheat oven to 325F / 160C. Toast pine nuts on a baking sheet for about 10-15 minutes until they turn golden brown, you want to maximize the pine nut flavour. Let cool. 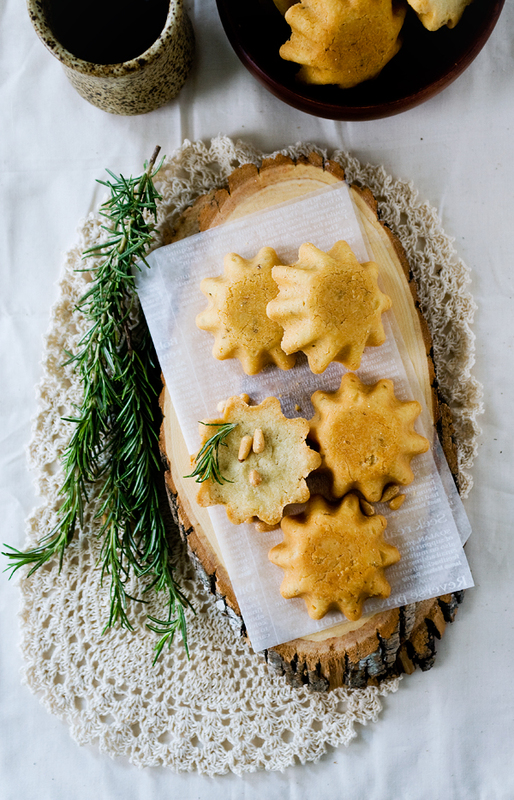 In a food processor, grind the pine nuts iwth 2 tablespoons of sugar, chopped rosemary and salt until the nuts are fine, be careful not to process them too much as it will start to turn into a nut butter. You can also use a mortar and pestle to grind them up. In a bowl of a stand mixer fitted with a flat beater, mix together the remaining sugar and the butter on low speed for about 1 minute, or until smooth and creamy. Scrape down the sides of the bowl. On low speed, beat in the egg yolks, 1 at a time, beating for about 20 seconds between each addition. Scrape down the sides of the bowl. Add in the pine nut mixture, liquor and vanilla and mix on low speed until the almond mixture is moistened. Beat for albout 20 seconds until evenly incorporated. Add the flour in four additions, mixing for about 20 seconds and scraping down the bowl after each addition. Scrape the dough onto a piece of plastic wrap. Wrap tightly and refrigerate the dough for at least 30 minutes until the dough firms up or overnight. Divide the dough into 10 equal parts, about 38 grams each or measure the whole dough, and just divide the weight by 10. Roll each piece of dough in floured palms and set it in the brioche pans (this is to prevent it from sticking to the brioche pan after baking). Press the dough in the pans, using your finger to push it into the fluted edges. If the dough gets too sticky, refrigerate until it is firmer before working with it again. Cool the cookies before unmoulding. Tap each inverted pan lightly and the cookie should come out easily. You can also insert and needle on the edge of a pan and invert to unmould. Storage: room temperature, 5 days; refrigerated, 10 days; frozen, 3 months. Recipe adapted from Baking Bible by Rose Levy Beranbaum, 2014, Houghton Mifflin Harcourt Publishing. If you don’t brioche pans of the same size as mine, feel free to use smaller ones and make more. 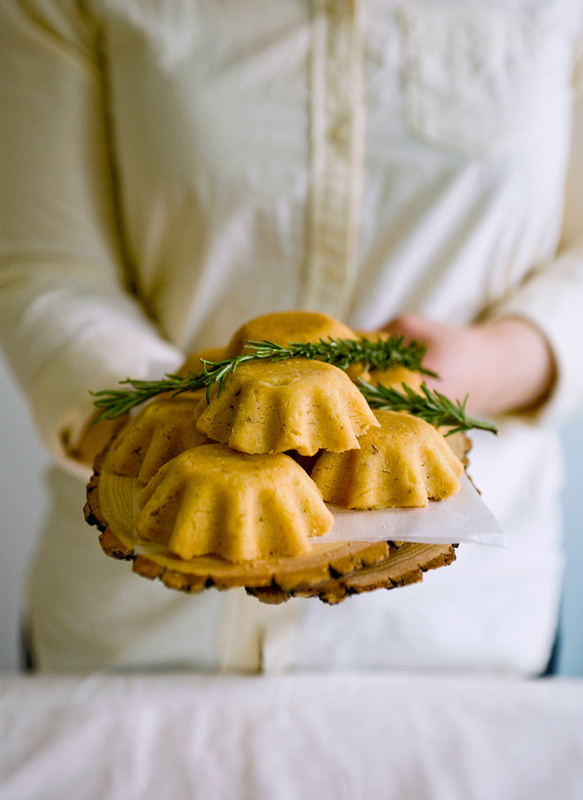 You can even use little fluted tart pans. 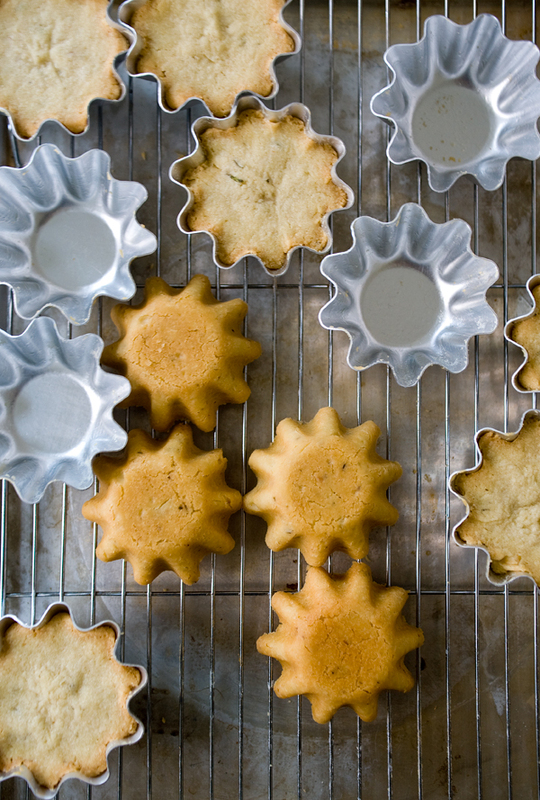 In the case of using different pan sizes, adjust the portions and baking time appropriately. Since this cake can taste a bit on the heavier side, I find the rosemary cuts through some of the heaviness of the butter and egg yolks. It adds a subtle earthy flavour and the pine nuts almost taste a bit floral when paired together with the herb. Though traditionally made without the addition of nuts, the toasted pine nuts adds an extra dimension of taste to this simple cake. I baked the original recipe and instantly fell in love its simplicity and melt-in-your-mouth texture. 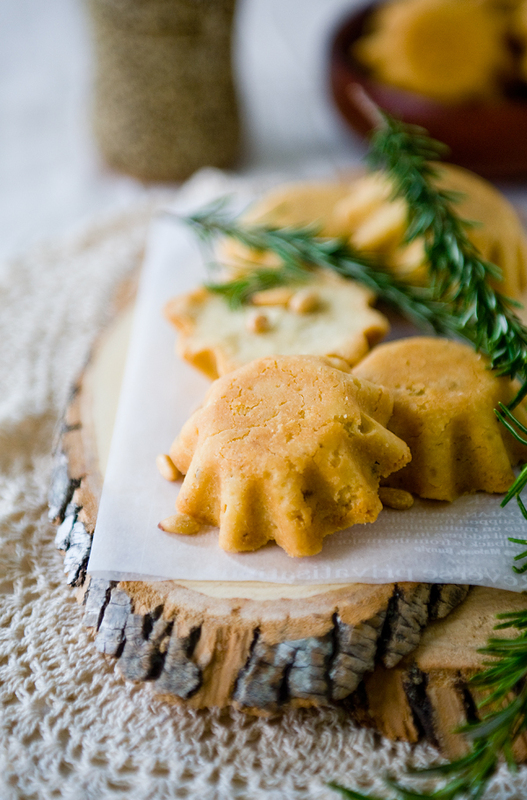 I wanted to experiment with different flavour profiles, and rosemary and pine nuts came to mind. It is like adding an Italian touch to a classic French pastry. I received The Baking Bible as a birthday gift from work and it is a great resource. Rose Levy Beranbaum writes very beautiful cookbooks. Her recipes are essentially foolproof even for a baking novice because of how detailed every recipe is written and how much resources are included and explained. This cake satisfies both my cake and cookie cravings, I love them still warm when the center is so soft and cakey. Hope you enjoy these as much as I do. Happy Baking! Oh wow, this is such a sophisticated little cake that I can’t wait to try so it’s pinned! Gorgeous pictures too! Thanks, the texture of this cake is divine!